Assc. Professor of Biology and Adjunct Curator of Vertebrate Paleontology, Greg Wilson, and his collaborators received the 2017 Bergstrom Award from the College of Arts & Sciences for their proposal "Prehistoric Body Theater"! Many congratulations to everyone involved! The team aims to being the Bergstrom funded project in January 2018. The Prehistoric Body Lab would run Winter Quarter 2018, concluding with an audition. The “Ghosts of Hell Creek” rehearsal process would run through Spring Quarter 2018, with the final performance / presentation in early May. Greg Wilson has invited Ari to join the June 2017 field work in the Hell Creek formation, Montana. Ari aims to film an independent documentary of the dig site for both the UW student participants and Ari’s Indonesian collaborators and community. 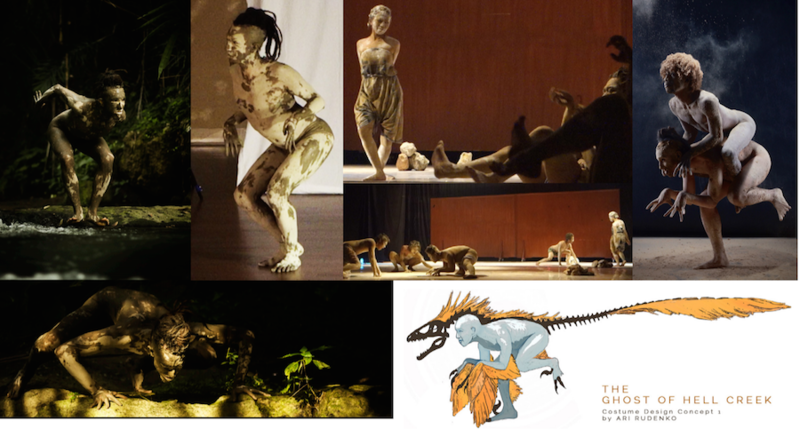 Prehistoric Body Theater is a conceptual performance modality oriented towards the creation of animal dance forms and theatrical scenarios based on the latest paleontological models of the behavior and anatomy of extinct organisms and the prehistoric ecosystems within which they lived. This project questions into the implications of a deep-time perspective on human identity, and our interconnected story with the evolution of other vertebrate lineages on the phylogenetic Tree of Life. The Prehistoric Body Theater was conceived by Ari Rudenko, an interdisciplinary art director, visual artist, and dance maker (MFA in Interdisciplinary Arts, www.arirudenko.com), who is currently teaming up with Burke Museum curator of paleontology Greg Wilson, Royal Ontario Museum curator of paleontology David Evans, and UW dance chair Jennifer Salk to develop this innovative transcultural art+science dance-theater initiative through an application for the 2017 Bergstrom Award. As an art director, Ari Rudenko is interested in the potential of putting the paleontologist into the role of choreographer. For the Bergstrom Award, we are proposing the creation of an experimental Prehistoric Body Lab at UW, where we will design a methodical program by which paleontologists can choreograph several species of prehistoric animals upon student participants from the dance and theater programs, culminating in both a performance by the participants, a documentary film generated from the Lab process, and also potentially generating a prototype curriculum for learning about evolutionary biology through experiential somatic practice and dance-theater performance. The collaborating paleontologists Greg Wilson and David Evans are both specialists in the fossils of the Hell Creek formation in Montana - a prehistoric flood-jungle ecosystem from just before, during, and after the Chicxulub asteroid impact and mass extinction event that marks the end of the reign of the dinosaurs, known as the K-Pg boundary. The Hell Creek ecosystem captures the critical transition from a dinosaur-dominated world to a mammal-dominated world, and holds the fossils of our most ancient ancestor, the earliest known primate named Purgatorius. “The Ghosts of Hell Creek” is a proposed Prehistoric Body Theater feature production portraying the lust, despair, and death of the last Acheroraptor - a hyper-carnivorous bird-like “raptor” dinosaur found and described by David Evans in the Hell Creek formation, and of the remarkable appearance of the first Purgatorius in the ashes of the asteroid impact, one of the main subjects of K-Pg mammal specialist Greg Wilson’s work at the Burke Museum. We propose that the dancers participating in the Prehistoric Body Lab will focus on developing the Acheroraptor and Purgatorius bodies and behaviors, developing a fluency with the greater Hell Creek ecosystem context of those characters, and culminate the Bergstrom Award funded project with staging a Prototype Performance of “The Ghosts of Hell Creek.” We anticipate this performance would attract both UW and greater Seattle contemporary performance audiences, the Burke Museum audience, and a diverse audience of paleontology enthusiasts. The final presentation would also include the showing of a documentary film generated by the Prehistoric Body Lab studio experiment, and lectures by Ari Rudenko, paleontologists Greg Wilson and David Evans, and Dance Program chair Jennifer Salk.